If you’re looking for a skin brightener that doesn’t contain retinol - we have just the ticket for your pigmentation challenges and those with skin sensitivity. What is the Best Non-Retinol Skin Brightener? Brightalive® is a ZO® Skin Health product that helps brighten the skin — without retinol. Which, for some people, retinol can cause increased skin sensitivity. Inside this little blue package are ingredients that work synergistically to help your skin reveal a brighter, more even skin tone. Skin brightening complex: Unique blend of skin brighteners helps block the production of pigmentation. Papain: Provides enzymatic exfoliation to remove dead skin cells. Glycerin: Replenishes hydration to restore skin barrier moisture balance. Stachys officinalis (leaf) extract, beta-glucan, helianthus annuus (sunflower) seed oil, rosmarinus officinalis (rosemary) leaf extract: Calms and soothes irritated skin. Brightalive® is helpful for anyone with pigmentation problems — especially post-summer when those spots start to show up even more. Because Brightalive® doesn’t contain retinol, this product can be particularly helpful for those who are sensitive to retinol, or have a sensitive skin type. If retinol and skin sensitivity is not a challenge for you, this product can be combined with a retinol for an added boost. 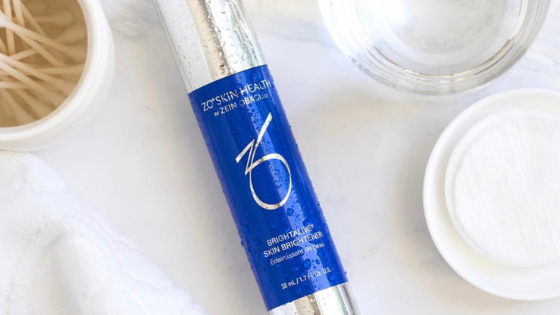 If you’re feeling like your complexion is on the dull side right now and/or you’re experiencing pigmentation challenges - ZO® Skin Health product Brightalive® could be just what you’re skin needs (especially if you’re prone to skin sensitivity and/or retinol isn’t your friend). And this product can also be combined with retinol-based product for an added boost, if needed. Ready to get started with Brightalive®? You can purchase this product at our online ZO store. Want to discuss ZO® Skin Health products for a skin care analysis and customized regimen? Contact Dr. Elijah | 719.553.2201 or RENEW | 719.423.0083 to get started! Sign up with your email address to receive RENEW NEWS (blogs, product features, events and more) straight to your inbox.